Last week, I was hoping that this week I would be able to report that all my spreadsheets were done and handed off to my accountant. Alas, I have not yet achieved that goal. The good news is that I have finished my spreadsheets. I finished the last of my five FIFO spreadsheets yesterday. Today, I took all of that information and put it into a summary spreadsheet that runs to almost four hundred lines. It was tedious, so when it was finished, I rested and played iPad games while drinking coffee and eating pie. When the pie and coffee were gone, I could have returned to the gathering of tax information. I could have, but there were seventeen games of Words With Friends waiting for me to take my turns. Some of my opponents were online and took their turns as soon as I took mine. I believe I will finish gathering my tax information tomorrow. I will get it to my accountant and then breathe for a few minutes before remembering that I need to start my quarterly inventory. I don’t usually run my income tax chores into my quarterly sales tax chores, but that’s just the kind of overachiever I am this year. I only hope I have learned my lesson and will start all this in January next year. This entry was posted in Uncategorized on March 30, 2016 by releaf1954. I seriously considered not writing a post today. I’m in a new year and I haven’t made any promises or commitments yet. I am under no obligation to publish something today. I could let it go. I could give it a rest. I could take a week off. I could do that, but I just keep thinking about that lovely progress report WordPress sends me at the end of the year, and how pretty that chart looks when there’s a post every Wednesday. That nice, straight line calls out to me from the future and begs me not to let it down. I don’t have a new goal, but I do love that straight line. I may not set a creative goal for this blog year. I know I want to paint, but what I want to do with that is just keep learning more about working en plein air. I don’t know if a new goal would help or hinder that effort. My last goal did get me to do forty paintings in just a few weeks and that was what taught me that I love painting outdoors, but I am not sure I want to have another Sword of Damocles hanging over my head. I may yet decide that I do. It won’t be this week, though. This week, I am too busy giving myself a hard time for putting off my income tax spreadsheets until the last half of March. I have started them, but I haven’t finished them. They are not difficult, but they are tedious. Most years, I start working on them in January in order to have the business information together, or at least starting to come together, by the time the W2 forms and 1099 forms start arriving. All those forms are here now. I have even received a corrected form that replaces one that came in January or February. I just need those spreadsheets for the business and I will be ready to bounce the income tax ball into the Accountant’s court. I have finished all the easy ones. That leaves Cost of Goods Sold, which can’t be calculated until I value my inventory. That’s the hard part. I can sit down and add up all my other expenses in a single session at the desk top, but valuing my inventory takes days. I will get there. I have begun it and I will finish it. Then maybe I will be able to think about painting again. I guess I should clean out my palette first. This entry was posted in Uncategorized and tagged goals, income taxes, painting, procrastination, spreadsheets on March 23, 2016 by releaf1954. I couldn’t stand it. Last week, I said that I was not taking my paints to the Will McLean Music Festival. I didn’t have room for them and I wouldn’t have time to paint. That’s what I said, but in the end, I couldn’t leave them behind. 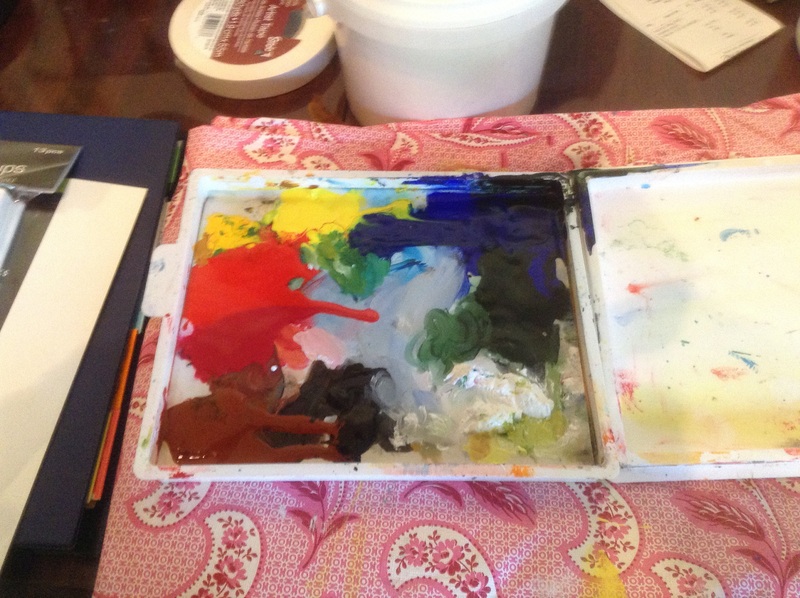 Just before I left to pick up my daughter, I stuffed my small Sta-Wet palette between two bags, dropped a couple of panels in a small space beside my overnight bag, and found space among the bins for my paintbox. I was still pretty sure I wouldn’t have time to paint, but I knew that if I didn’t bring my paints, I would pine for them. Wonder of wonders, I found time to paint. We arrived at the venue in the early afternoon on Thursday, found our spot and started setting up our booth. When the booth was up, we worked on the changing tent and our sleeping tent. 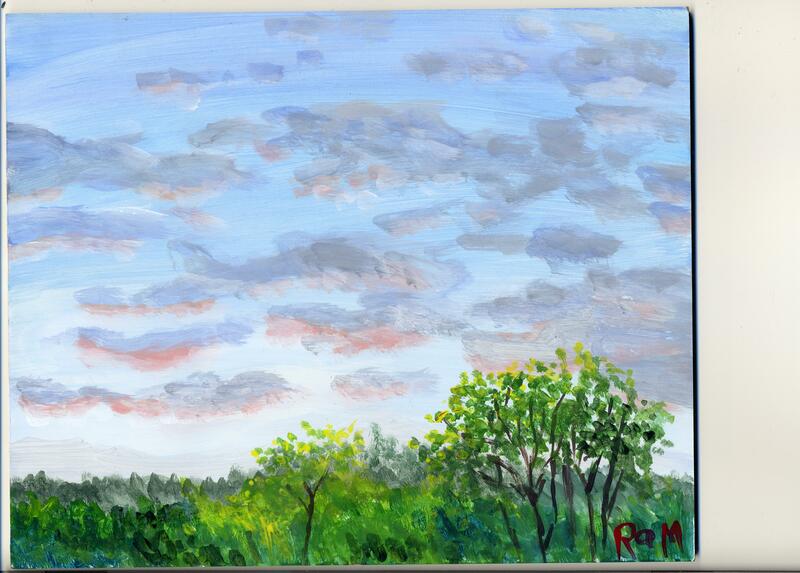 My daughter saw the way I was looking at the sky and said, “Go ahead and paint. I’ll set up the air mattresses.” I didn’t argue very much. The sun was setting and there was no time. The sun went down so quickly that I ended up doing a lot of this one from memory, in a twilight that was almost completely dark. I didn’t get a good look at it until the next morning. I could see that it was rough, but I loved it. I had to set it aside quickly and get ready to sell tie-dye, but every time my glance fell on it during the weekend, it made me smile. 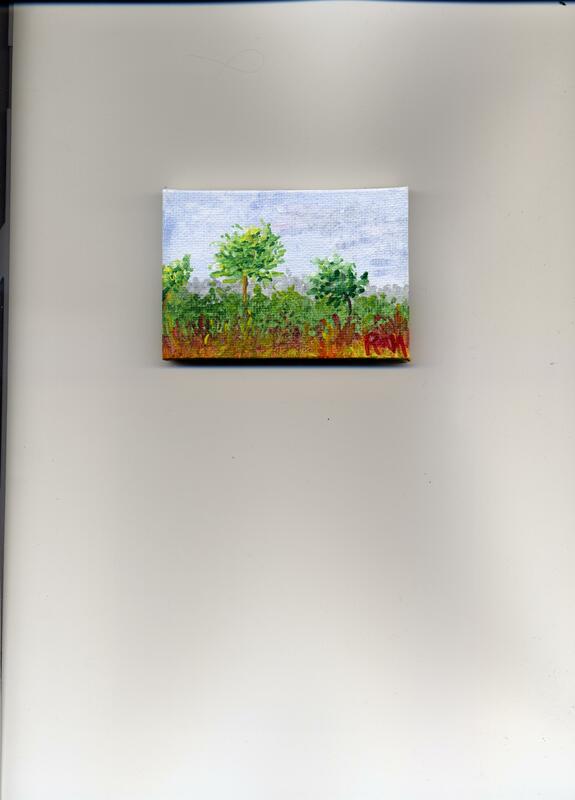 That one 8” x 10” would have been enough, but I also managed to squeeze in a tiny painting on Saturday. I found a little time in the morning, before we opened our booth, to paint the view from our camping spot. It’s just sky, rushes and a few trees, but I like it. Sunday, I did not paint, but I did take some photographs. Everyone who had a picture-taking device took photographs that day, because something unexpected happened. We were just standing in our booth, taking care of business, when we heard a loud cracking sound. We looked up and saw a huge tree come crashing down by the creek across the way. People started running over there from all directions. Someone said, “Call 911,” but someone else said, “Nobody’s hurt.” Once everyone was sure that was true, all the cameras and phones came out. It was quite a sight. Someone said that the folks who had been camping in that spot had pulled out not fifteen minutes before. 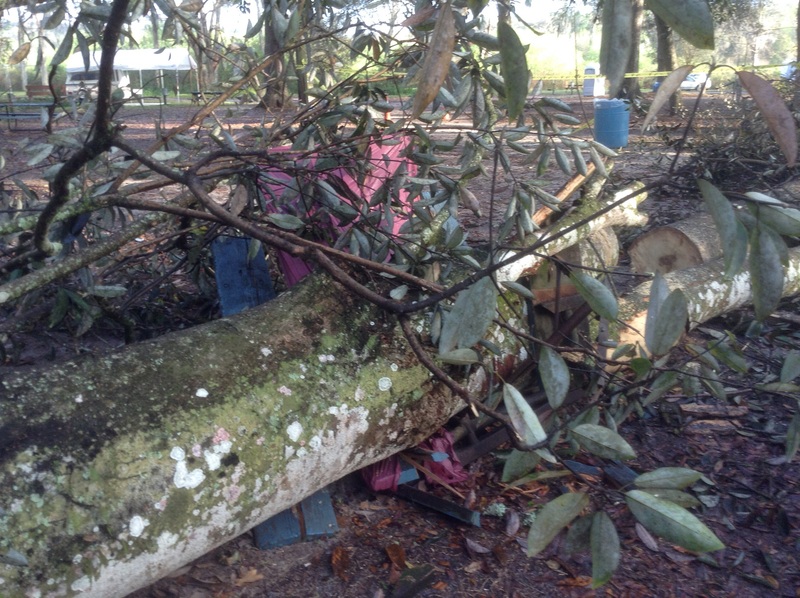 A sturdy picnic table was completely smashed. I hate to think what would have happened if anyone had been sitting at that table. I took a few pictures and went back to my tie-dye booth. The next morning, I went back to take another look. 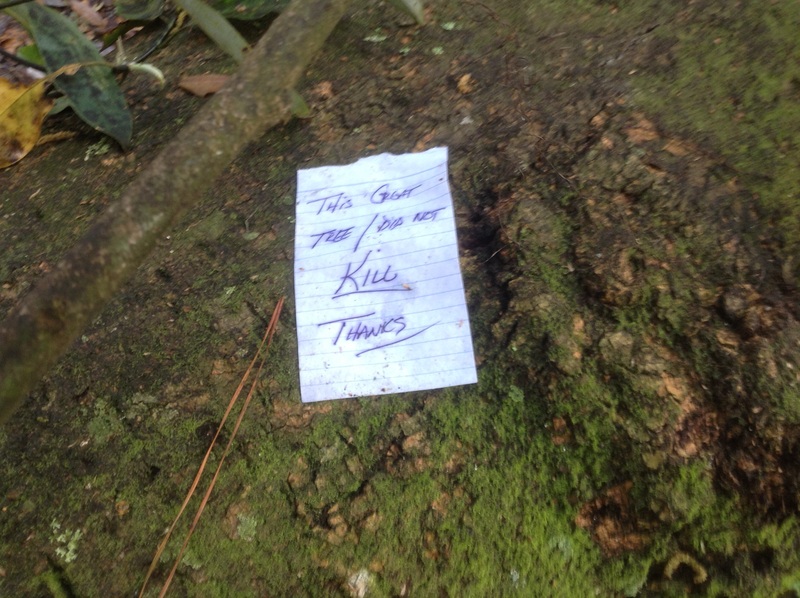 Someone had left a note on the tree. Yes. Yes, indeed. Thank you. 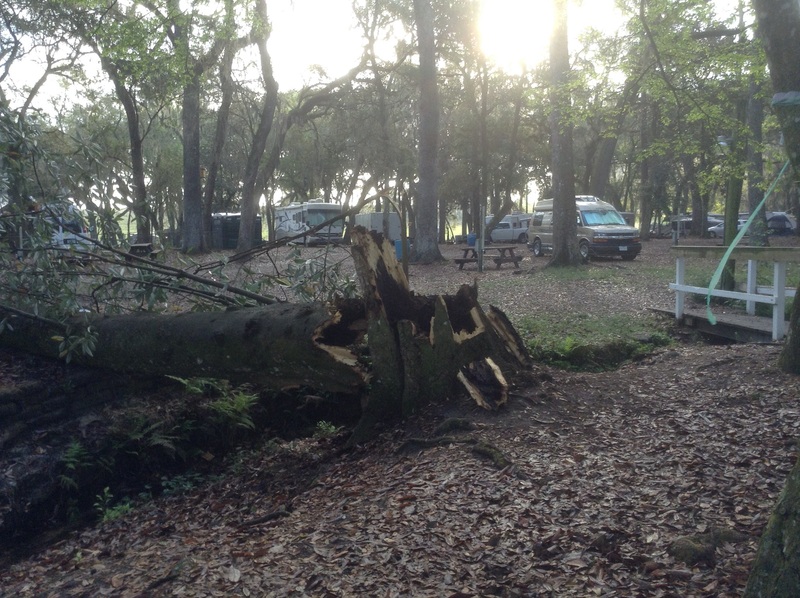 This entry was posted in Uncategorized and tagged fallen tree, painting, sunset, Will McLean Festival, Willfest on March 16, 2016 by releaf1954. I know it’s Wednesday and Wednesday is blog day, but this particular Wednesday is “load up for Willfest” day and that doesn’t leave time for a carefully worded blog post. My daughter and I spent the day gathering up all the personal things and business things we need to camp for three days and sell tie-dye at the Will McLean Music Festival at the Sertoma Youth Ranch near Dade City, Florida. That’s a long way from Jacksonville, so we want to be careful not to leave anything important behind. I wish I had room to bring my paints, because the location is beautiful and the event is so joyful and inspiring that it opens my heart and makes me want to do creative things while I’m there. I’m there to sell tie-dye, though, and that is a job that takes most of my time and all of the van space. I will have a small sketchbook and some watercolor pencils. Maybe I can fit in a sketch or two when things are slow. The good news is that I did paint this past week. I was out in my back yard making tie-dye and I noticed that the morning light was particularly pretty on the three trees in my neighbor’s yard. 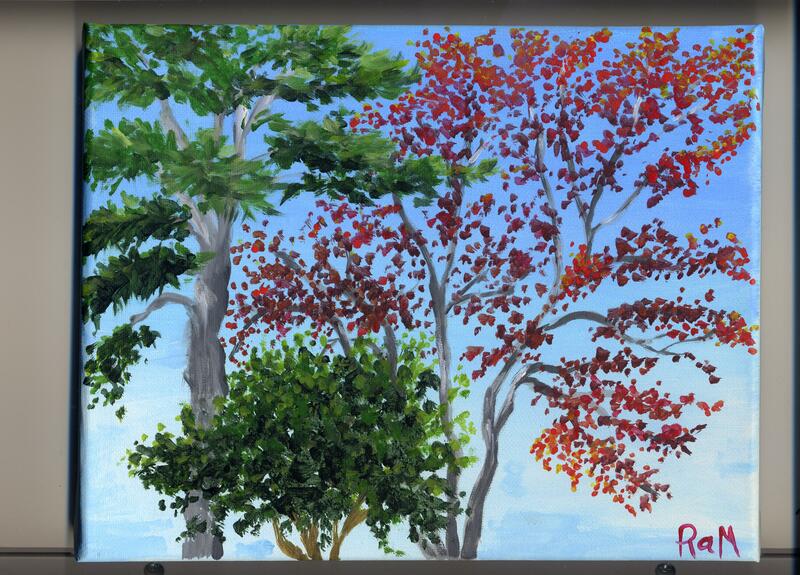 The next day, while the tie-dye was batching, I tried to paint those trees. If you’re a follower of this blog, you’ve seen two of them before. I’ve painted the tall pine and the little holly twice, but I edited out the maple because it was January and the maple was naked. Now it’s March and that tree is covered in bright red helicopter seed pods. Here’s my new painting. I normally try to give my posts clever endings, but I’m just too tired this evening. I painted. I blogged. I’m done. This entry was posted in Uncategorized and tagged camping, painting, Will McLean Music Festival, Willfest on March 9, 2016 by releaf1954. It’s azalea season in Florida. 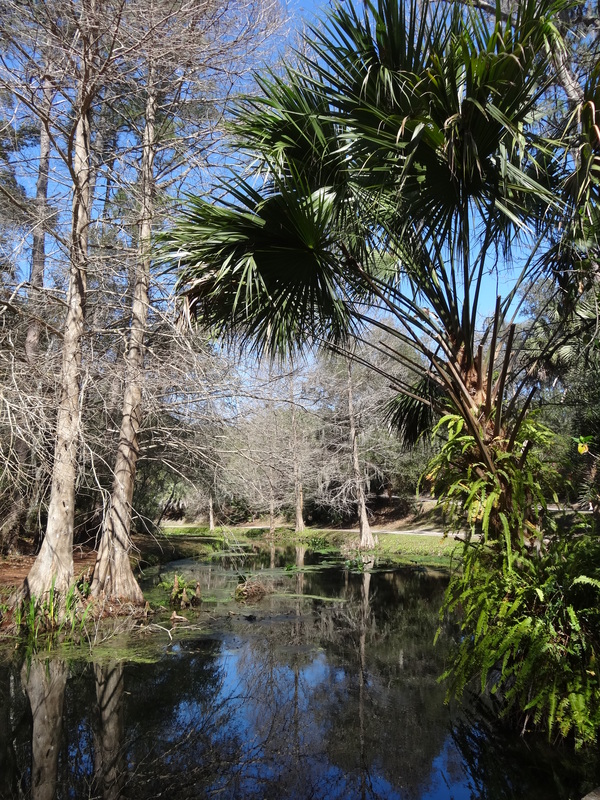 Every year at this time, we talk about driving to Ravine Gardens State Park in Palatka, because it has hiking trails that pass through banks of azaleas on all sides. It’s a beautiful place any time of year, but it’s spectacular during azalea season. We talk about it every year, but we hadn’t actually done it since my now sixteen-year-old grandson was a toddler. No one had a problem with Tuesday, so we started making preparations. We picked up drinks and snacks and sandwich ingredients for a picnic lunch. We got my daughter to agree to have the boys up and dressed by nine o’clock in the morning – a major concession, but, hey – we were going on an adventure! It was a lovely adventure. 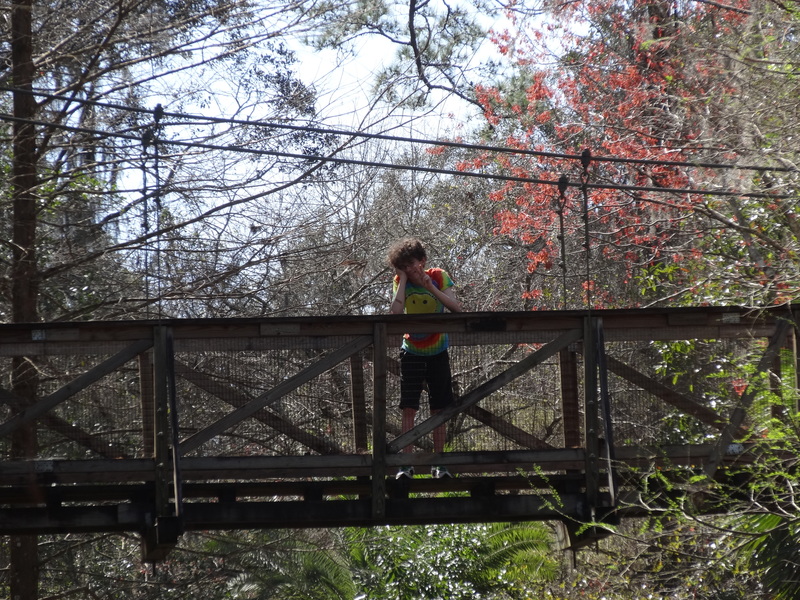 We got there early enough to enjoy a hike on the azalea trail before lunch. The kids were a bit nervous about the two suspension bridges, but they conquered their fears and learned to enjoy themselves. The sixteen-year-old even made a special effort to go up again all by himself, just to prove that he could do it. I was proud of him. There are picnic tables all over the park, so we had no trouble finding a place to have our lunch. There is an automobile road that goes all the way through the gardens. We chose a picnic spot on the edge of that road in order to have easy access to our cooler, which stayed in the back of the van. After we finished our sandwiches and snacks, we cleaned up our area and got back into the van to drive to the lily pond under the second suspension bridge. The boys had chosen that spot for their art project because it was so pretty. 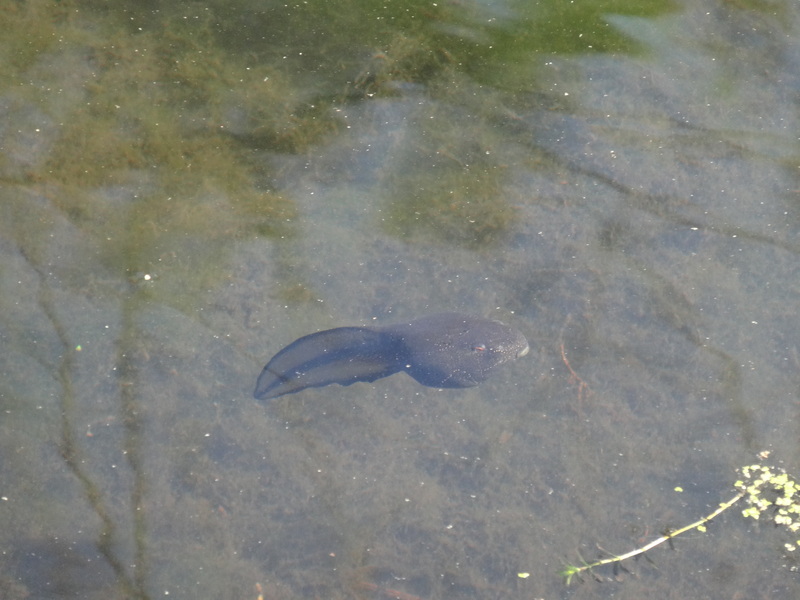 It was also interesting because the pond was full of big, fat tadpoles and lots of little fish. 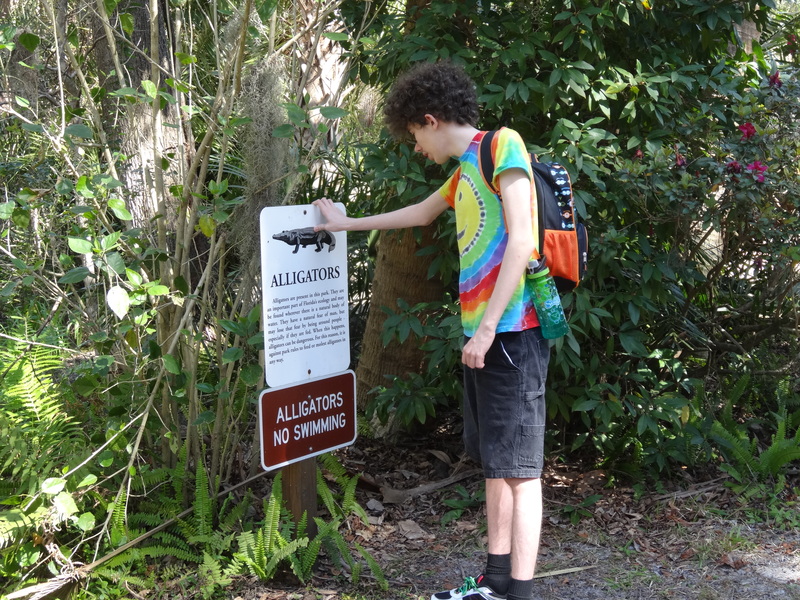 A sign warned of alligators but we didn’t see any. Maybe they saw the sign that said, “Alligators No Swimming” and obeyed it. My grandsons used watercolors to create pictures inspired by the things they saw in the park. I don’t know why I didn’t realize there would be a painting break during this adventure, but I didn’t, so my paints were left at home. Oh, well…I had a lovely time relaxing in the shade while the boys created their works of art. Even after our hike and our lunch and our relaxation at the lily pond, we still had plenty of time to get back to Jacksonville before rush hour, which was the only goal my husband set for this adventure. I don’t think he would count napping on a bench at the lily pond as a goal. 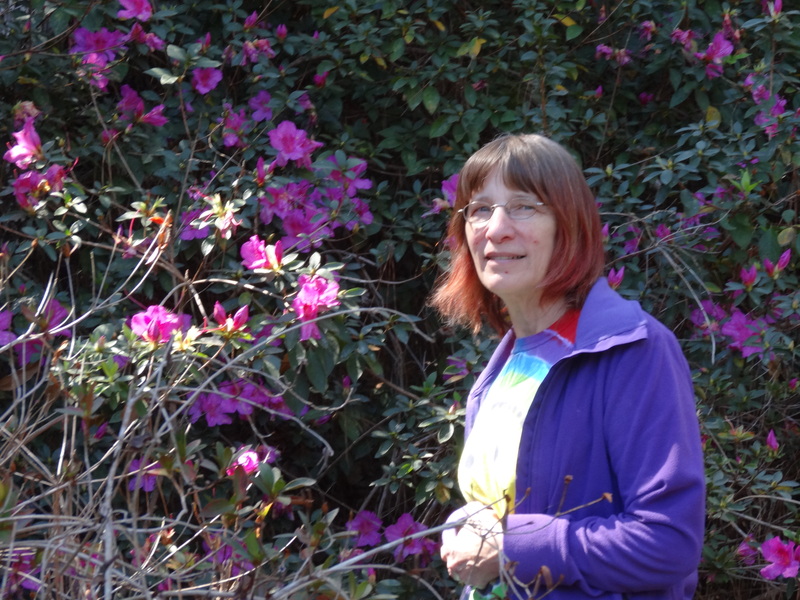 This entry was posted in Uncategorized and tagged adventure, azaleas, hiking, lily pond, Ravine Gardens State Park, suspension bridge on March 2, 2016 by releaf1954.